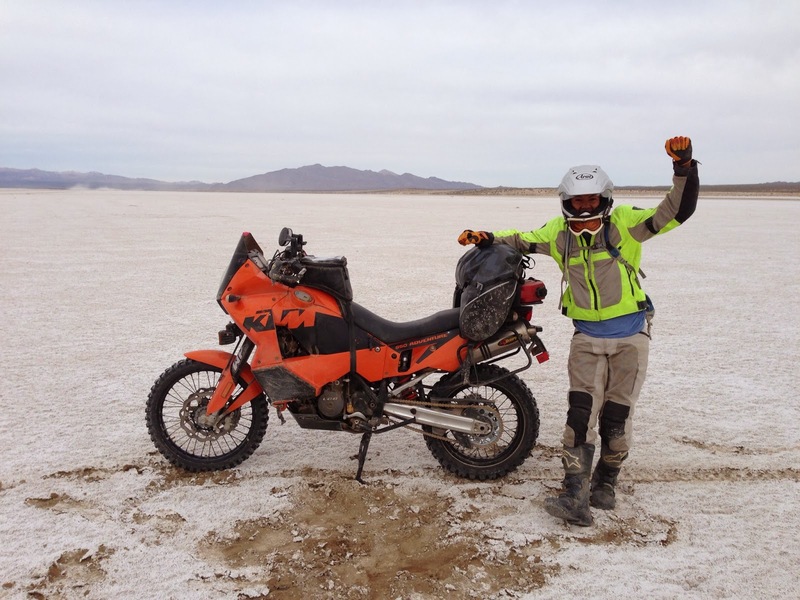 Our friend and adventure partner Bill was killed in a motorcycle accident on December 2nd 2013. 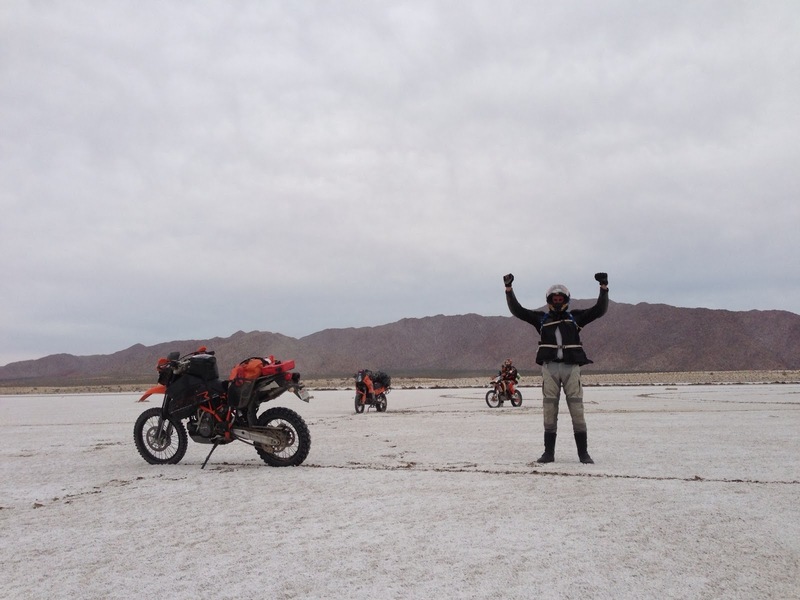 Prior to his passing we had started to plan a motorcycle trip to Baja California to happen just after Christmas. Bill was an adventurer and we thought a great way to honor him was to go on the trip we had planned and take his memory with us. 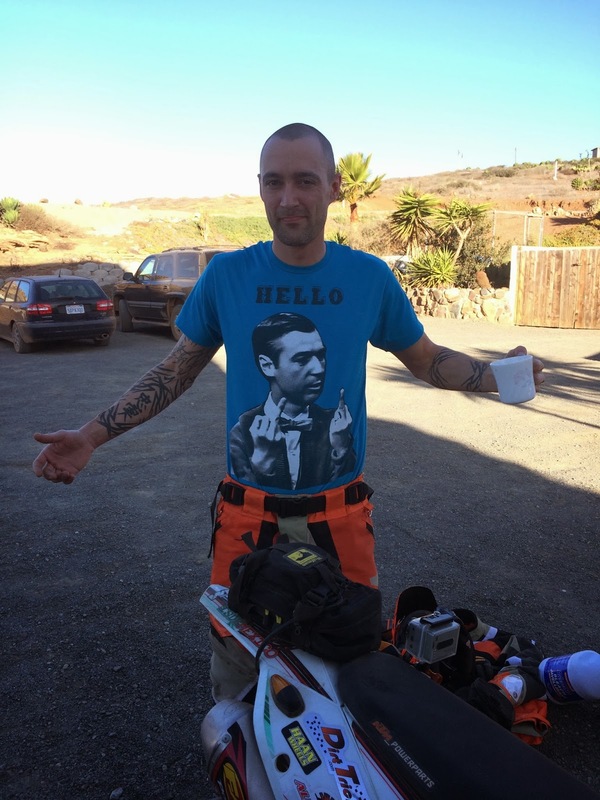 We brought with us some of his gear, ashes and pictures of him attached to our bikes. Bill, this ones for you. After getting over the border I rode to Santa Monica went to dinner with my brother in law and then went out in downtown LA with my sister and her friend for New Years. Steaks at 3am and then up at 7 for the blast home up the PCH. On my bike at 8:30 but not on the road until 10am because my bike wasn't big enough to set off the garage door sensor. 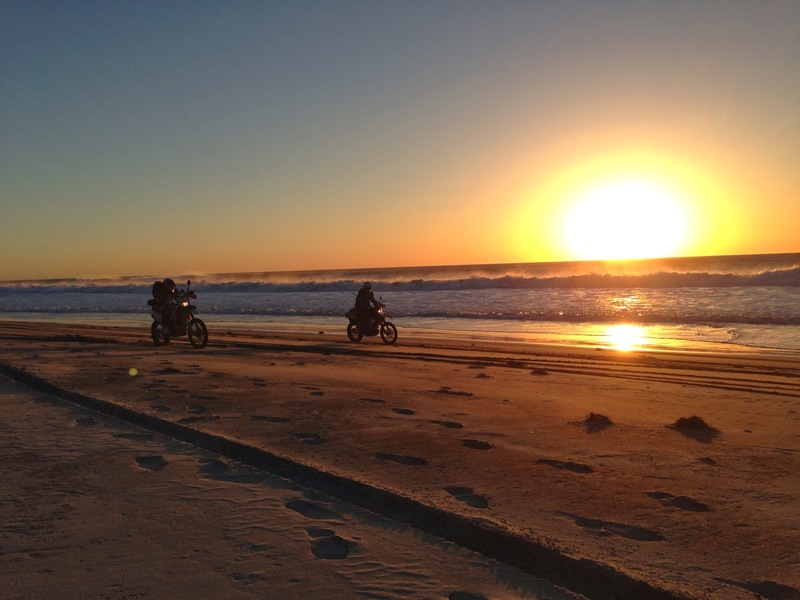 Long ride up the PCH. Started getting tired and ran out of light around Santa Cruz. Decided to take the windy way (route 9 and skyline past alice's) to try and wake me up. It worked ... what a blast those roads are at night! Home safe and sound. What a trip! 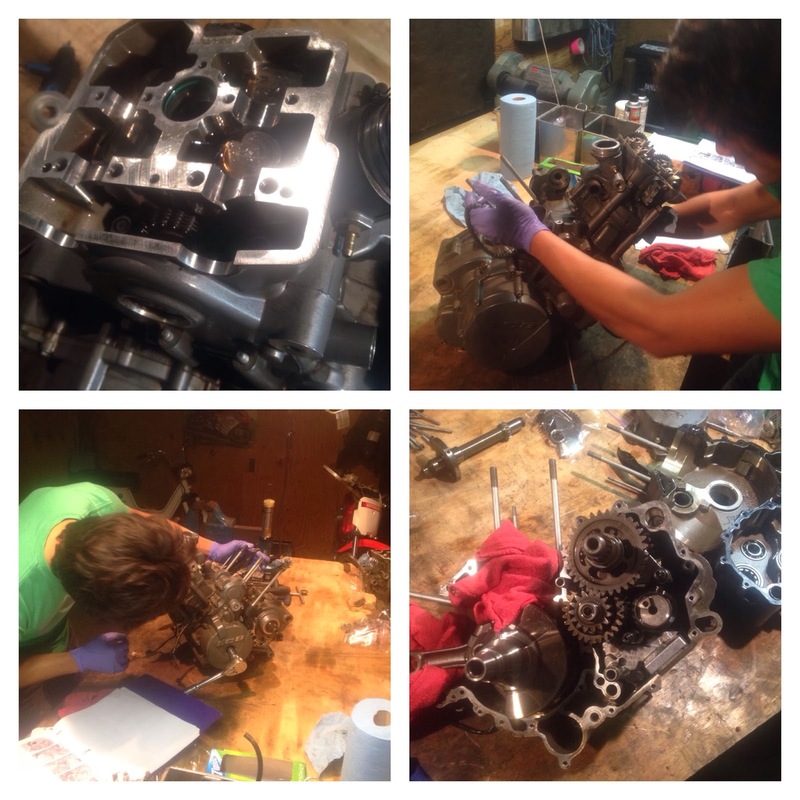 While I was playing around in the dirt and actually even before I left, Jonny and Jimmy were hard at work fixing Jonny's transmission. A job which most people wouldn't even consider attempting. It involved dropping the entire engine and cracking the case. They did attempt however and got it done well and in record time! 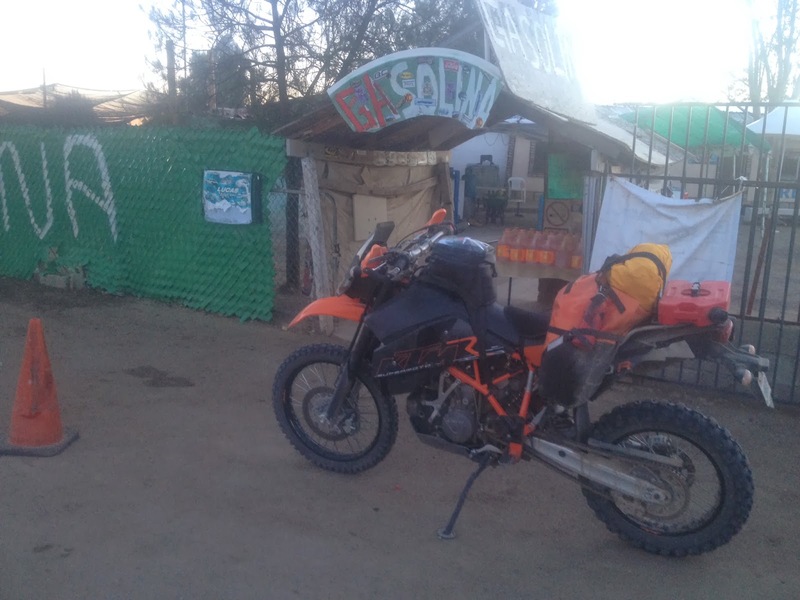 We set out early for Baja from our motel in Boulevard, CA. After some coffee we went to start our bikes and get on our way. Off to a good start ... Jimmy's bike has a flat battery. After I selflessly helped bump start his bike (as you can see by the picture) we got on our way! Jonny printed out some pictures of Bill and we all had them front and center on our bikes. 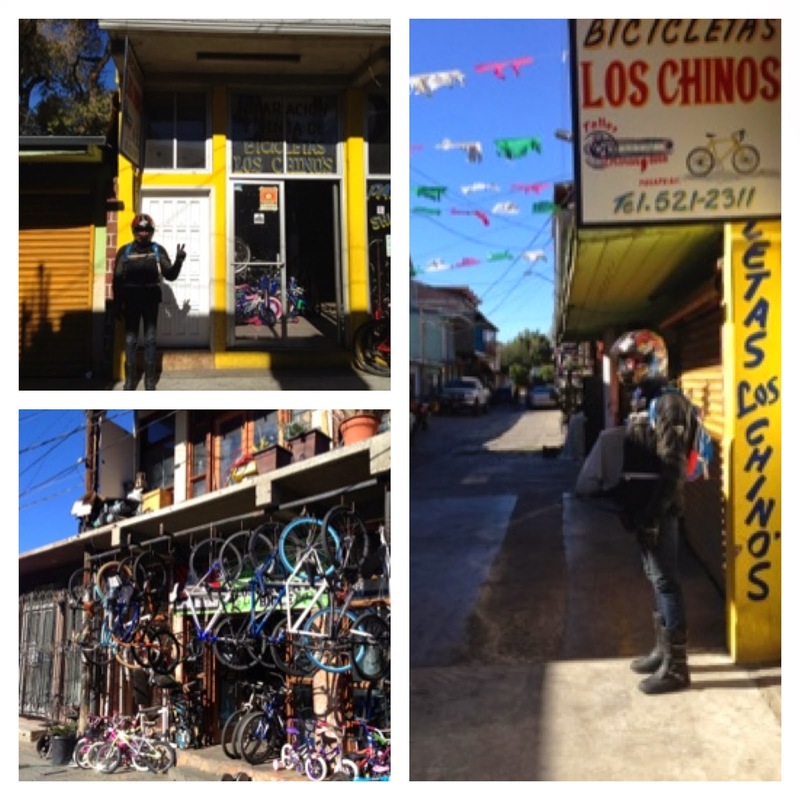 After a short ride to the border we set off in search of visas, food and inner tubes seeing as I destroyed our supply before even setting off. We found a cool spot to have breakfast and we actually found some inner tubes at a local bicycle shop. Had a short ride on pavement before we found our first dirt. Some pretty high quality dirt roads to start. Then we took a short detour on some single track. We didn't make it very far before I got stuck and we decided to go back ... too early into the trip for that kind of stuff. 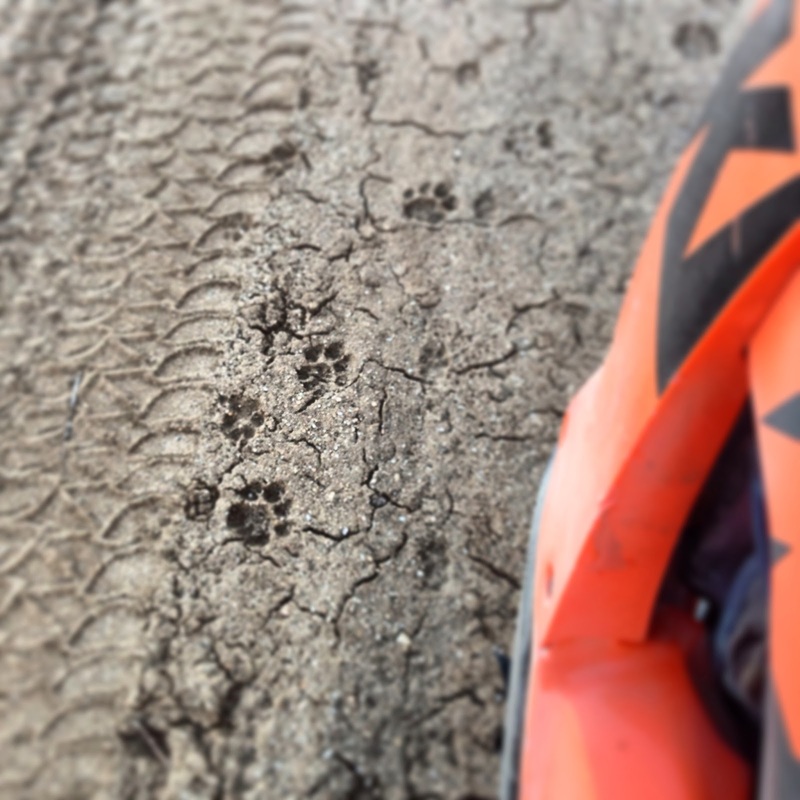 Lots more dirt roads (and some paw prints) until we got to Casa de Verde for lunch, a biker friendly ranch with beds and food. We ate tomales and a soup I forget the name of. 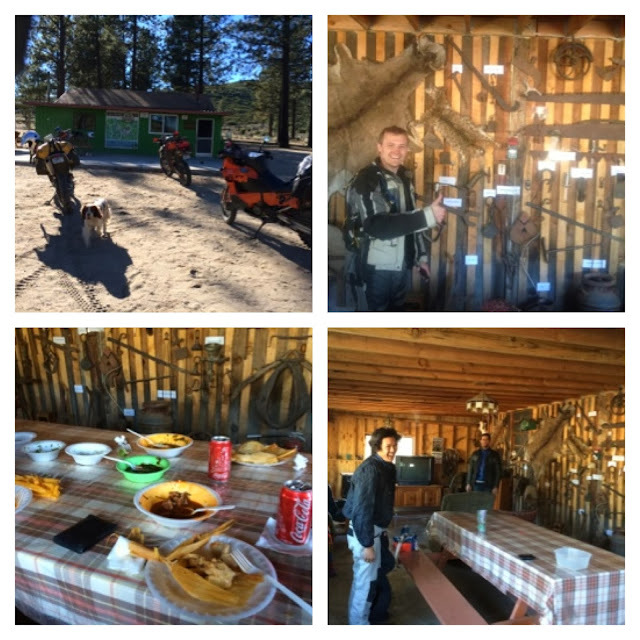 After lunch we set off to ride through the forest and then to camp at Canyon de Guadalupe. We ran out of light on our way back up to the highway which we need to take to get across the mountains. 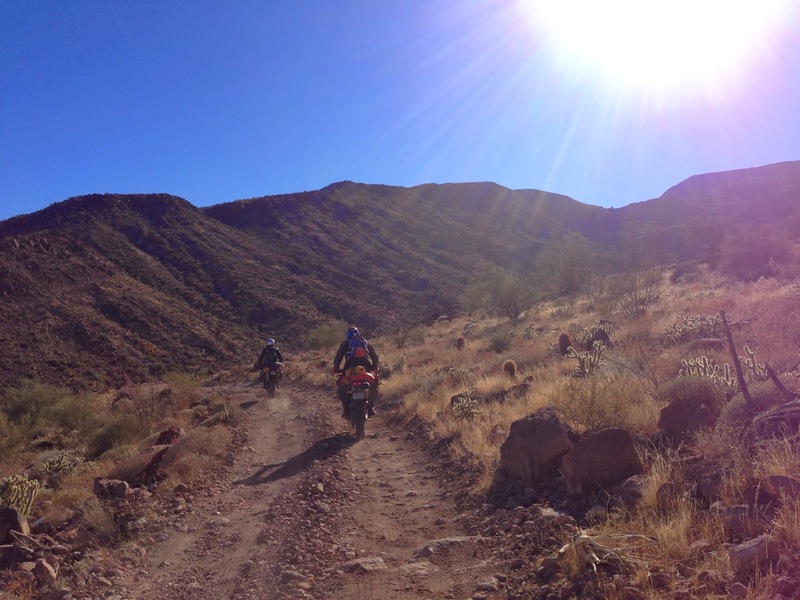 After a short stint on the highway we still had another 30+ miles of dirt to get to the camp site. We stopped for gas and water and then headed on our way. 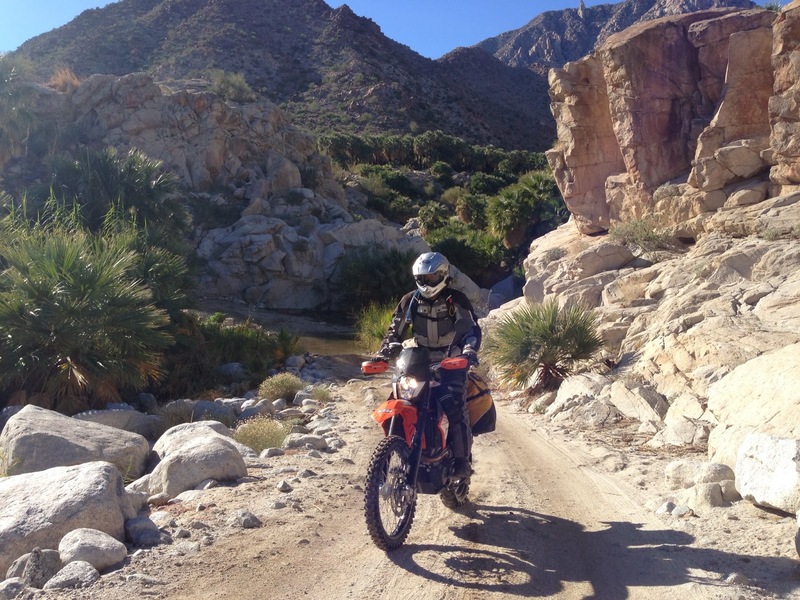 There were two main tracks into the canyon, one was a graded dirt road and the other was a dry lake bed. 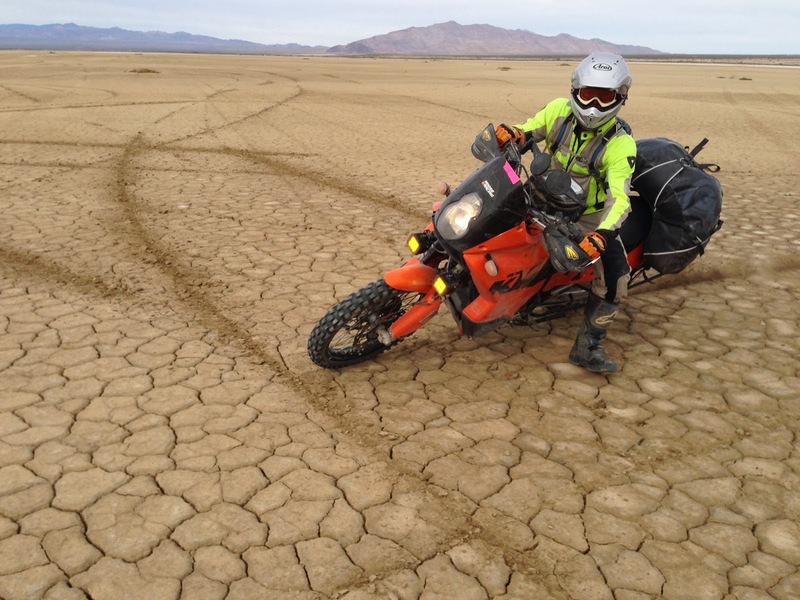 I wanted to take the dry lake bed because I heard it was supposed to be really awesome. However, seeing as it was dark we figured it would be safer to take the graded dirt road. After 30 horrible miles at 50+ mph on washboard dirt road we hit the entrance to the canyon. 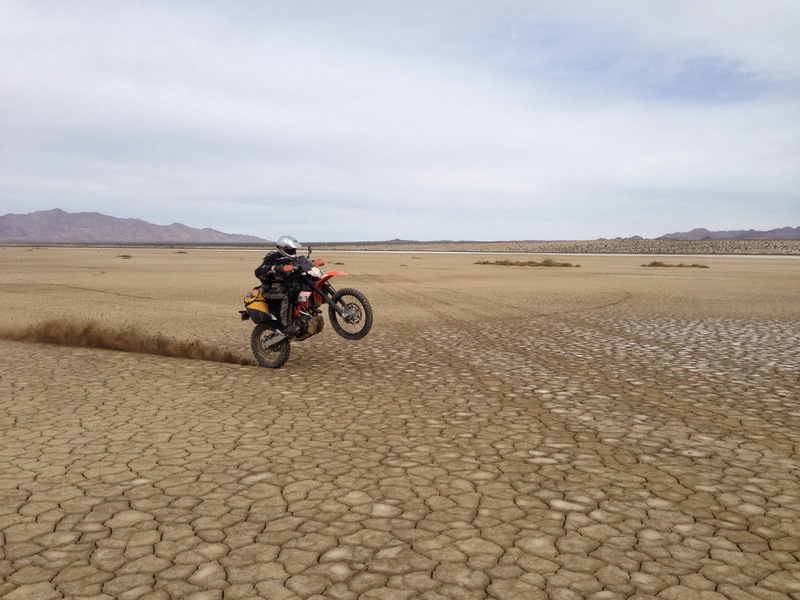 We later learned that the lake bed was hard packed, smooth and it was easy to go 70+mph on ... ah well. When we got up to the camping spot we realized it was much more built up than we had expected. 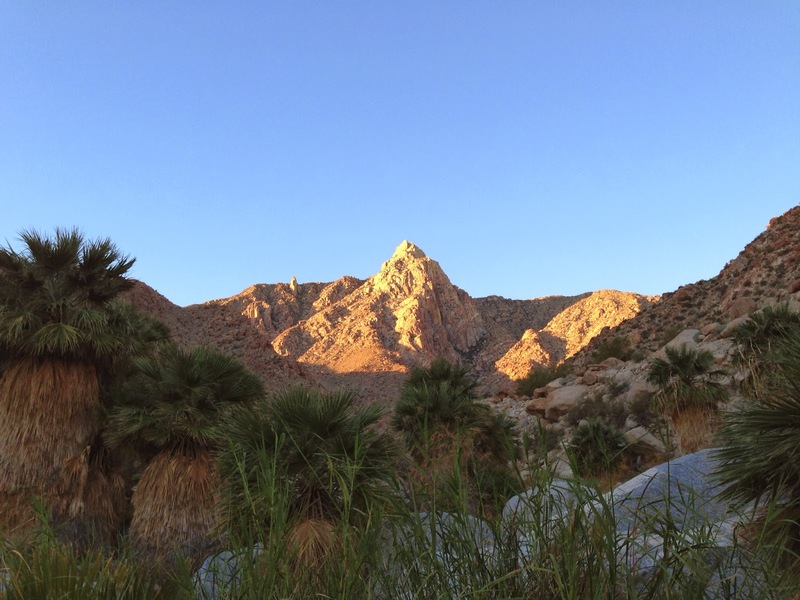 In fact you had to pay for a camping spot but there were hot springs! Each camping spot had their own private hot tub and some even had huts to stay in. We rented a camping spot from a cancelation at a "discounted rate". In the morning we saw how beautiful the place was. In the morning we actually ran into Jimmy's neighbors from San Francisco that were there on vacation. Small world! 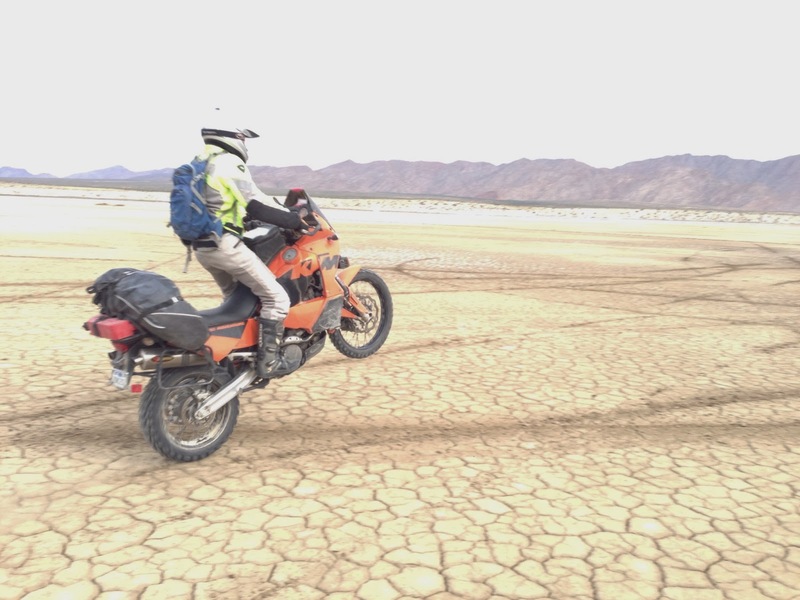 We set out back through the small river crossing and from then we headed south with the ambitious goal to find an alternate route to the highway back over the mountains. 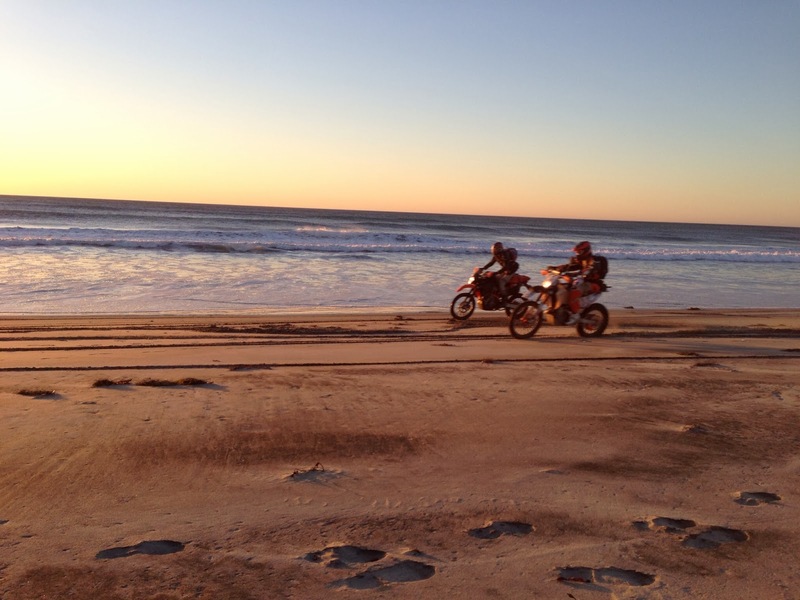 The start to our ride was 25 miles of deep sand. 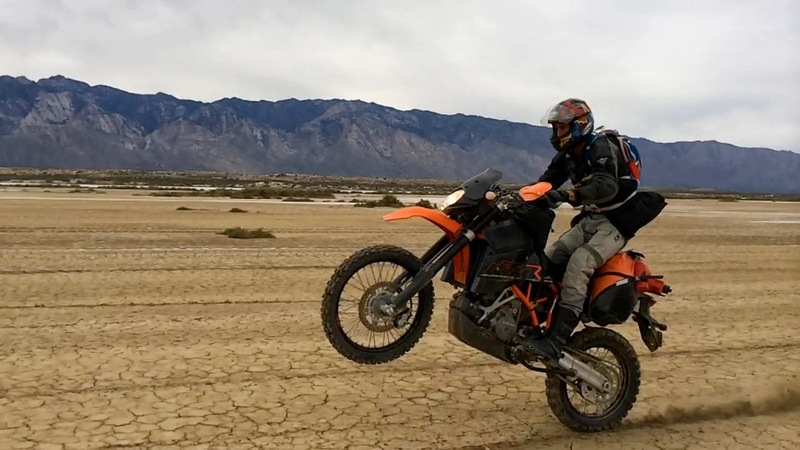 A chore for the big bikes but quite fun on my light 690. Then we started to climb. At first it was pretty mild incline but rocky and long. After several more miles of the rocky climb we came across a dead Baja 1000 car. 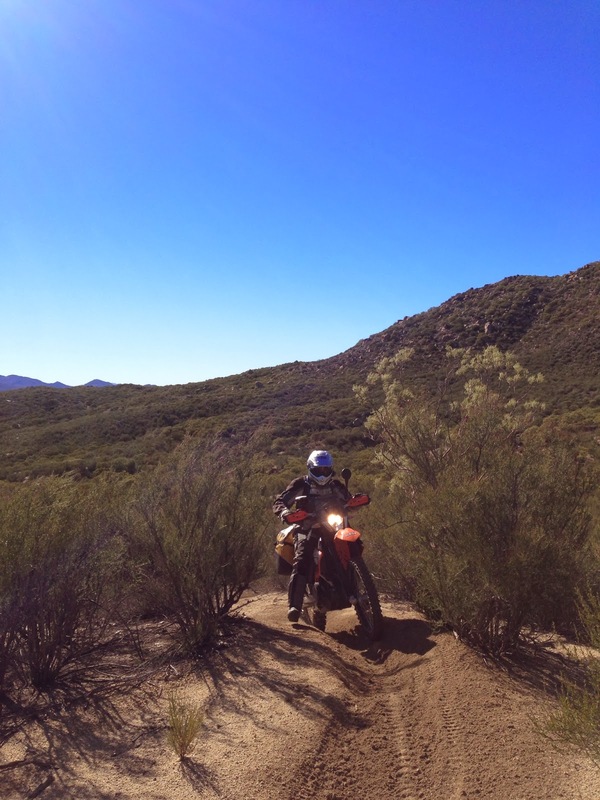 In fact most of the morning we had been on the Baja 1000 route going in reverse. That's when it started to get pretty gnarly. Steep rocky climb up the mountain side with a pretty good fall on one side and rock face on the other. Jimmy went for it and charged up the hill. 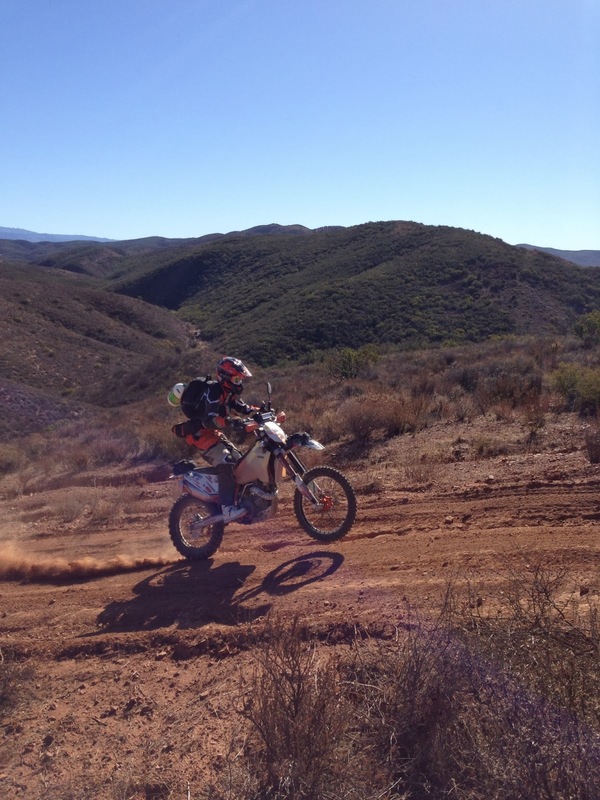 Jonny and I eventually got to the top after a couple tip overs and difficult starts in the middle of the hill. When we finally got to the top we were exhausted but rewarded with an epic view! We decided that this would be a good place to spread some of Bill's ashes. With a shout we sent some of Bill's ashes into the canyon. I found the experience to be very powerful, sad and wonderful all at the same time. As we were heading out to leave we started talking about fuel. Jimmy was running low. We were pretty certain that it would be a photo finish to the nearest gas station if we made it at all. 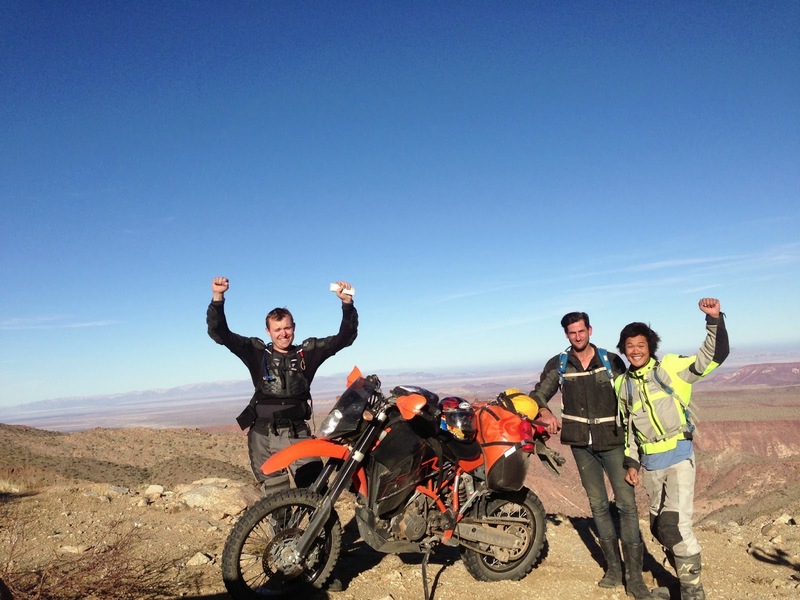 Just after Jimmy puts some of my spare gas into his bike we see three 4x4's heading up the pass in the other direction. It turns out to be a bunch of hunters heading down the other side of the mountains to go deer hunting. We asked them about gas and they said that the nearest gas was far enough away that we were pretty certain we wouldn't make it. The morning's ride was tough for gas mileage and with our couple of detours I don't think we would have made it. The hunters were awesome though, they offered us beers gave us 1.5 gallons of gas and refused any money. Turned out to be enough to get us safely to gas! We found gas on the side of the road from a guy selling gallons out of various household plastic containers. We bought enough to get us to the next real gas station. We also stopped for some well earned grub ... it was a long morning and took us way longer than anticipated. 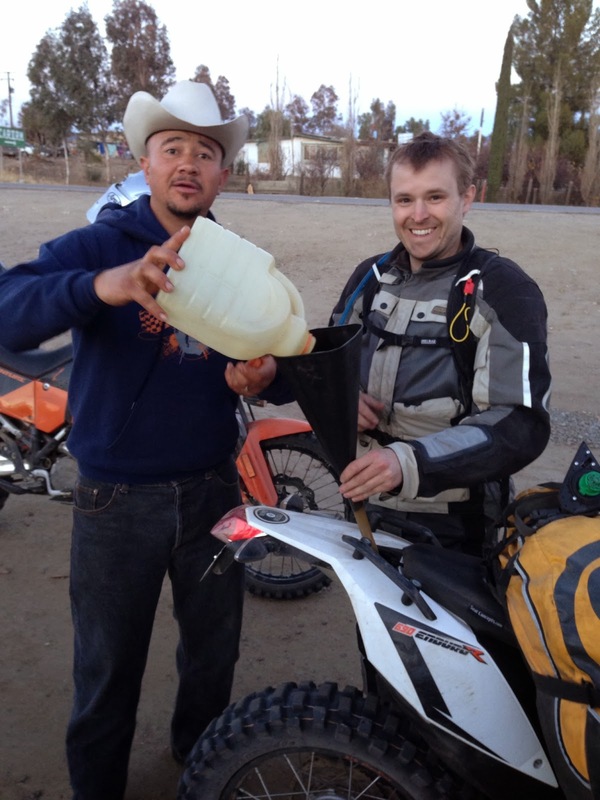 We were now out of light and decided to blast on highway to San Felipe (east coast) for the night. 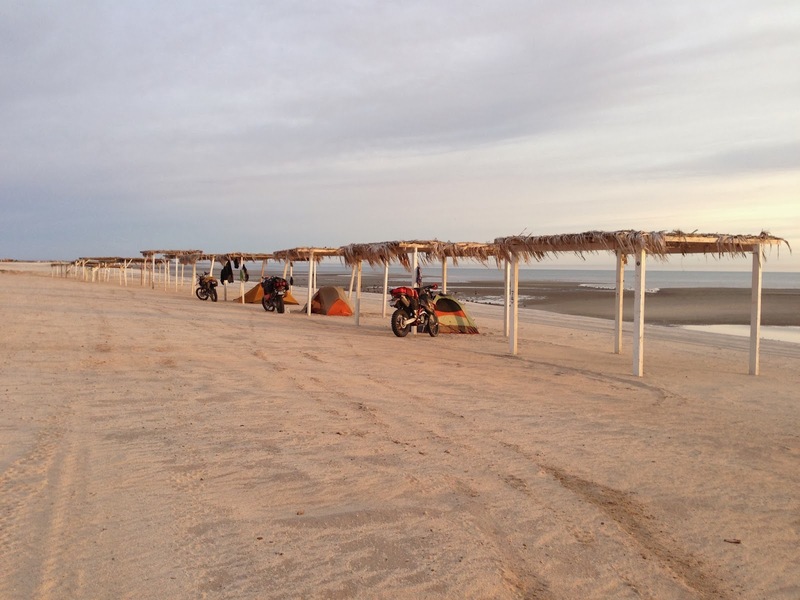 We heard there was a lot of good riding around San Felipe and a good spot to meet other travelers. We came across a camp site called "Pete's Camp". Pretty cool spot where you could camp right on the beach. We got a shower and a meal and a good night sleep on the soft sand. The place was pretty empty except for two bikers from Canada. 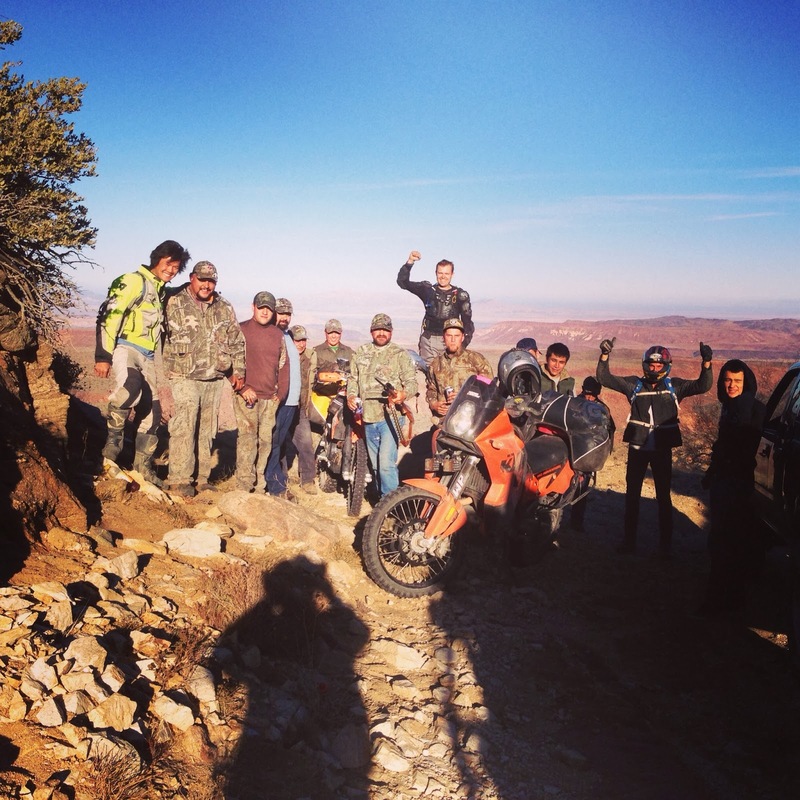 They turned out to be really cool guys and seeing as we had no solid plans we decided to ride with them the next day. We attempted to figure out a route and then set off. That's Fin (left) and Joe (right). Not 20 miles into our ride Jonny's flat troubles started. We burned off some of our gas so after topping off his tank the Canadian way, Joe and the rest of us headed on our way. Goal was to get to Mike's Sky Ranch to eat and sleep. On the way I noticed Jonny's tire going flat again. He pulled over to change it. All changed but then ... pop. Tire goes flat. Upon inspection we realize that we got a bad tube and it completely exploded. Jonny has to change for another tube. We had a little trouble getting the bead to set and already he's starting to get annoyed with flats, if only he knew what he was in for. Again the Canadians stick it out with us and we head out for Mike's in the dark. 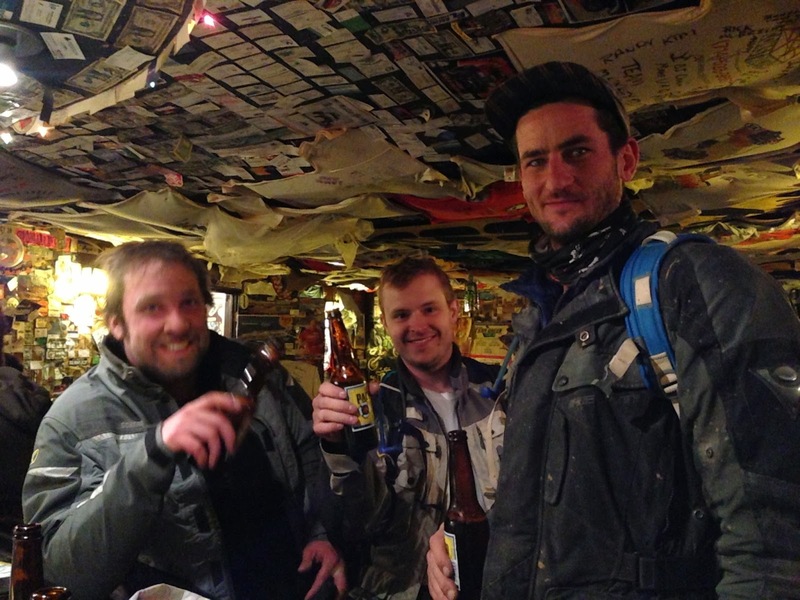 A fun night ride through the dirt to Mike's and we get ourselves a much earned beer (or 5?). Mike's is a famous biker spot and it's a pretty neat spot. You get to ride your bike into the interior of the structure. The next morning we decide to take the "hard" way out of Mike's. It's supposed to be really quite difficult coming to Mike's but apparently doable on bigger bikes heading down the hill. It was quite a loose decent and we could see how it would be quite challenging coming up. But we were all glad we went that way. Fun little challenge early in the morning complete with some good climbs. 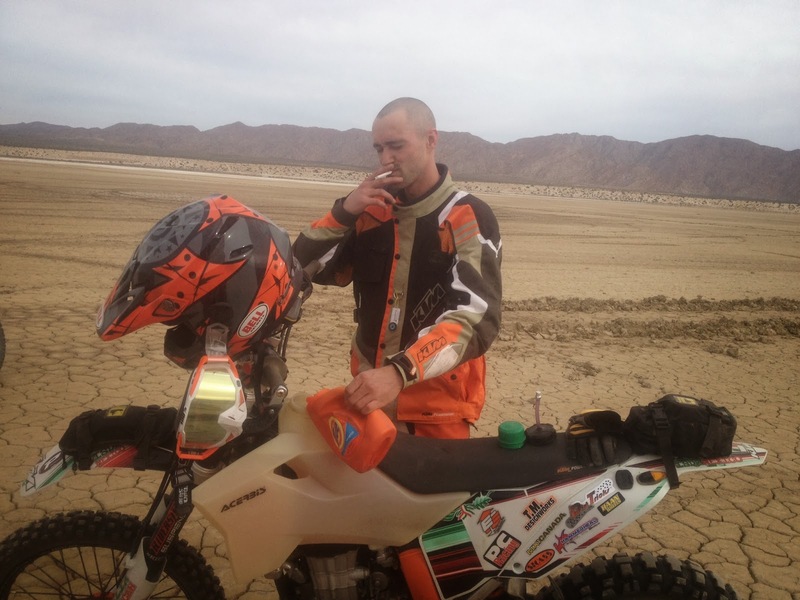 As we were taking a break, Jonny heads to his bike and then we all hear, "psssshhhhh". Another flat and right in front of our eyes. Yet another tire change and we start to think that the cause of all the flats is the damaged side wall of Jonny's tire which has exposed metal. We "engineer" a hack we think might help which involved covering the damaged parts of the side wall with strips of rubber from our exploded tube. We continue on our way west. 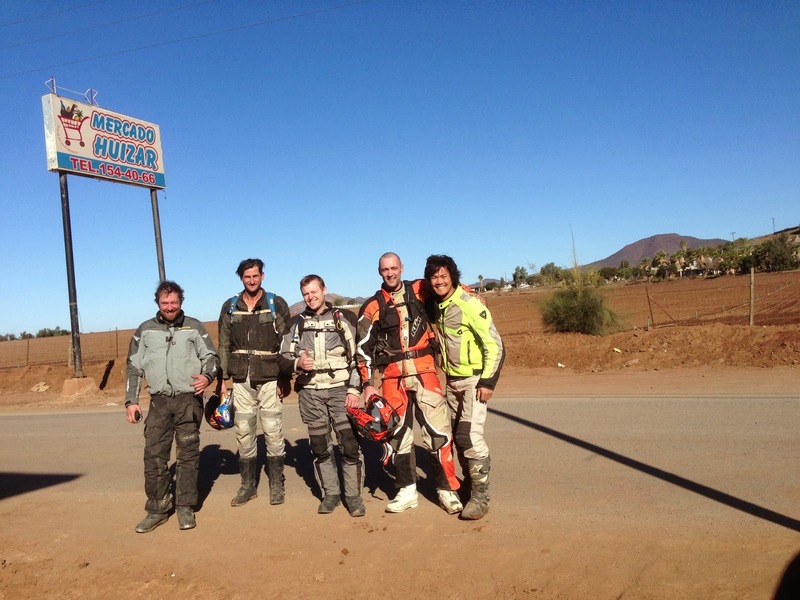 Our goal is to stay at Coyote Cal's which is a hostel and biker destination in Erendira. 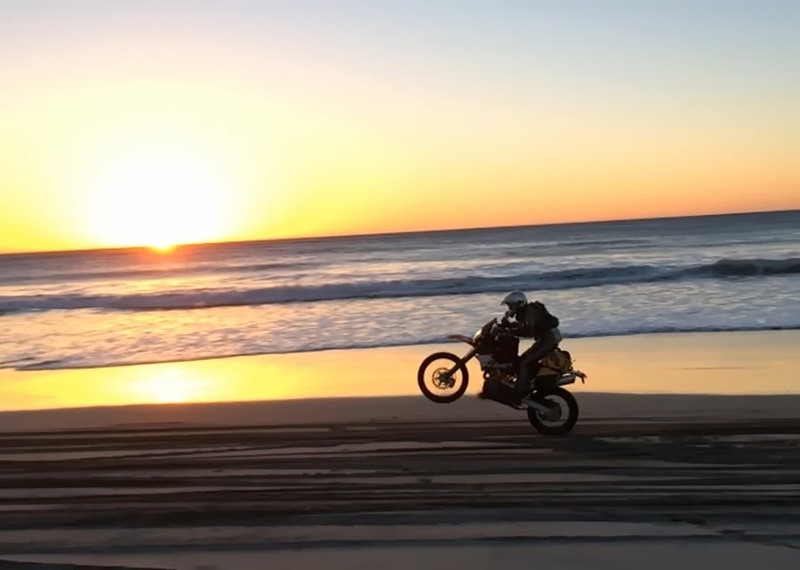 We hear there are beaches all along the coast that you can ride on. We are getting close and then we get another flat. Not Jonny this time ... Joe picked up a nail. 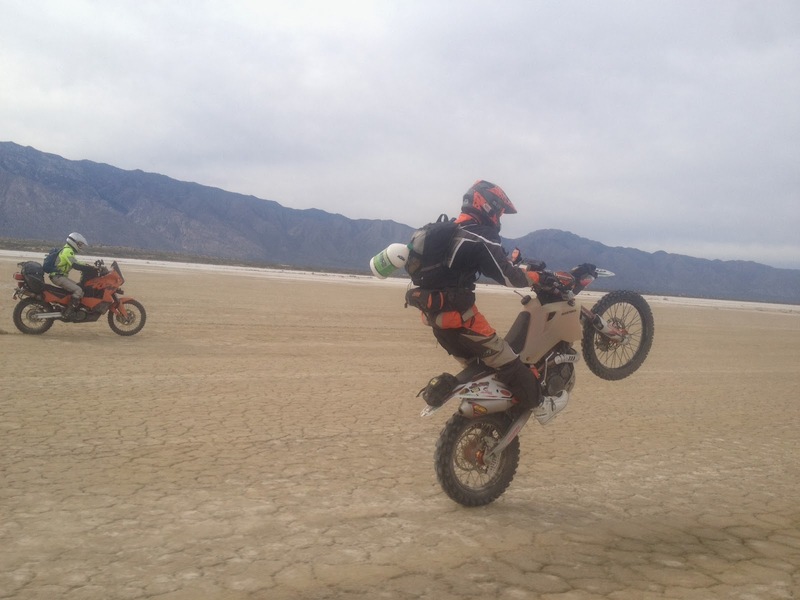 Meanwhile Jimmy shows off the improvements he has made to his bike. 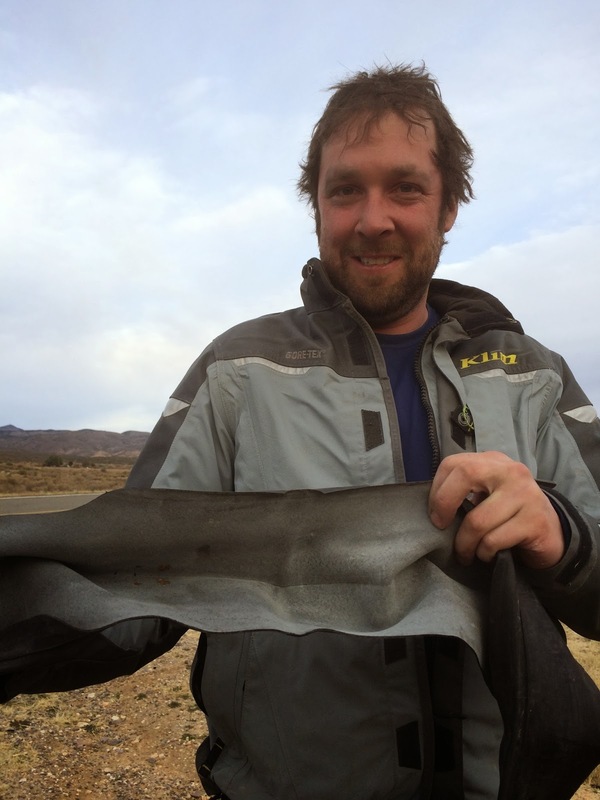 During one of the tire changes he found a dvd sleeve on the side of the road which he proudly displayed on his bike. On to the beach. Which was just amazing. We rode up and down the beach, tiring ourselves out but having a blast. And as the sun started to set it just got better and better. We spread more of Bill's ashes here I think he would have really digged this spot. Another night ride to find a place to crash and we make it to Cal's. Pretty cool little place with absolutely terrible beds. I think we all struggled to get much sleep as we were all uncomfortable and very cold. I set off to a number of different shops in town but it was a very small town and there wasn't any tires large enough for Jonny's enormous bike. 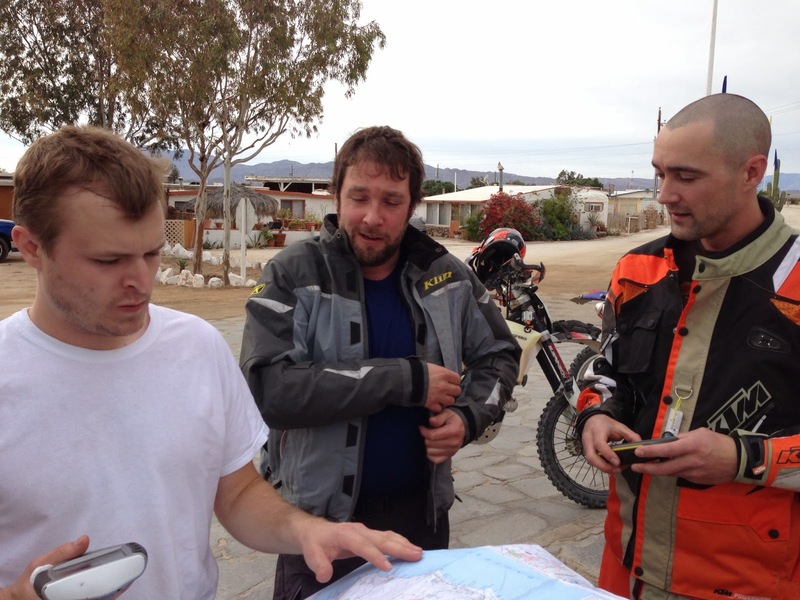 The Canadian's had to get back to San Felipe that day so they had to set off. 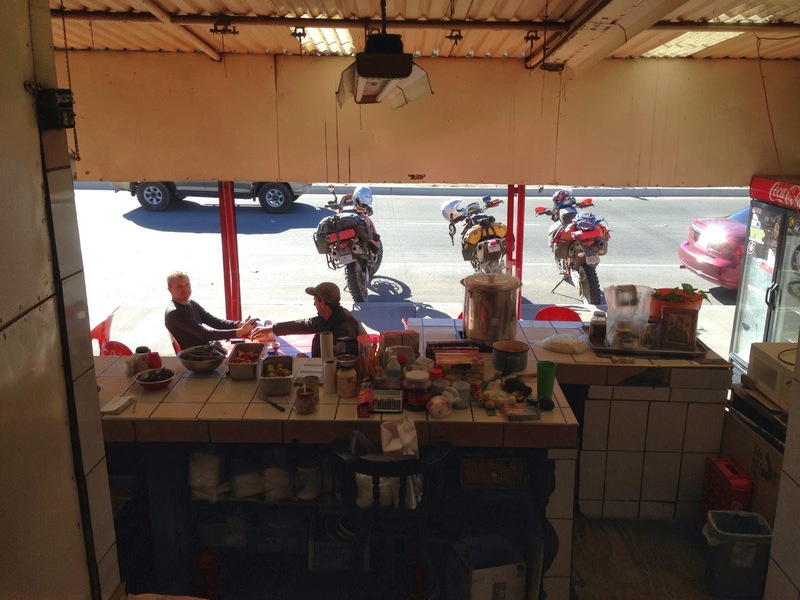 We were planning on splitting up after lunch anyway and we decided to start heading north towards Ensenada, a bigger city with some moto shops, and then the border if all else failed. 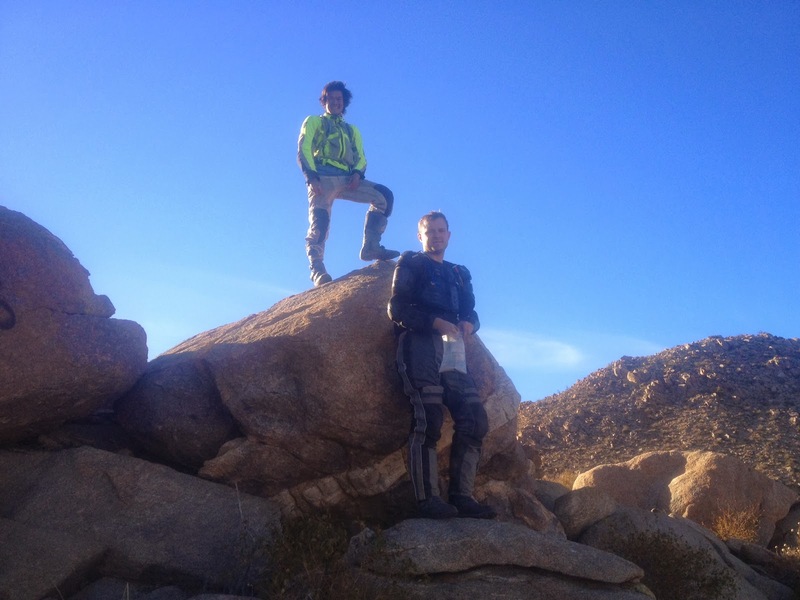 We had a great time riding with Fin and Joe and we are already planning our next ride. Thanks guys! 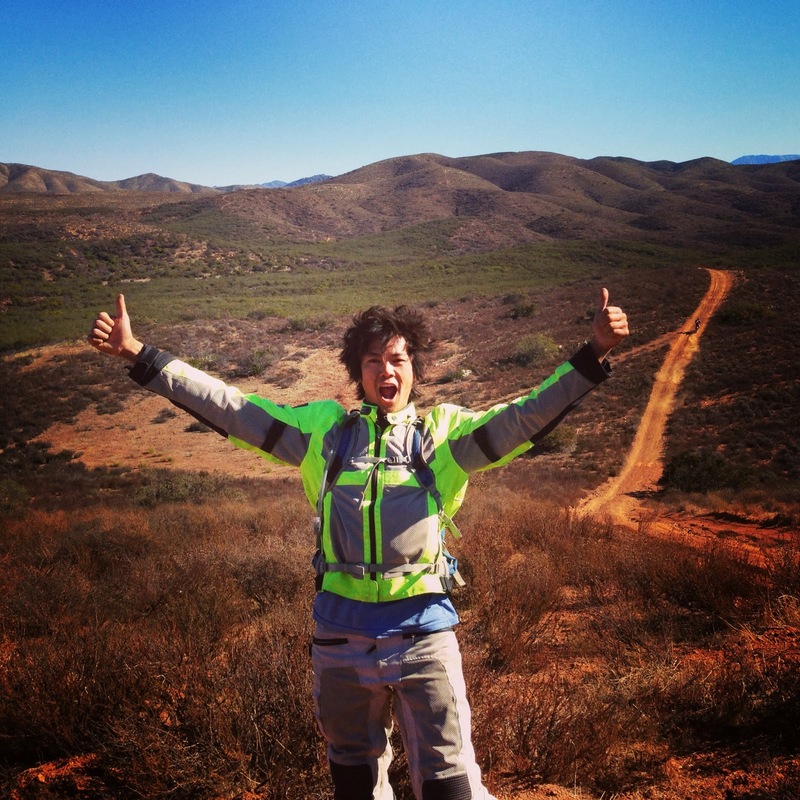 We put yet another patched tube into Jonny's tire and headed at a slow pace on pavement to Ensenada. We didn't get far before his tire went flat again. 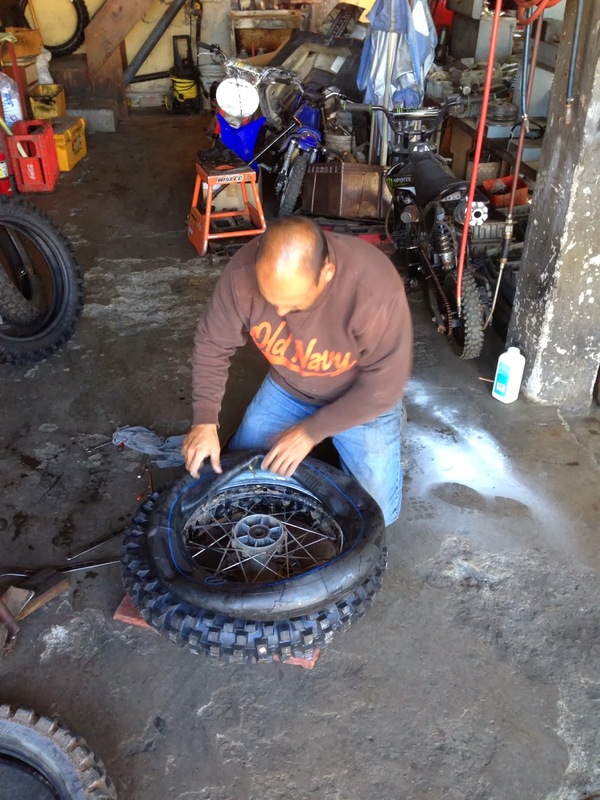 We knew we needed to hitch to Ensenada to try and find a new tire or to Tecate to get to the truck. It didn't take long ... the third truck that passed stopped to pick us up and agreed to take us to Ensenada which was a good 30 miles out of his way round trip. The kindness of strangers on this trip was overwhelming. 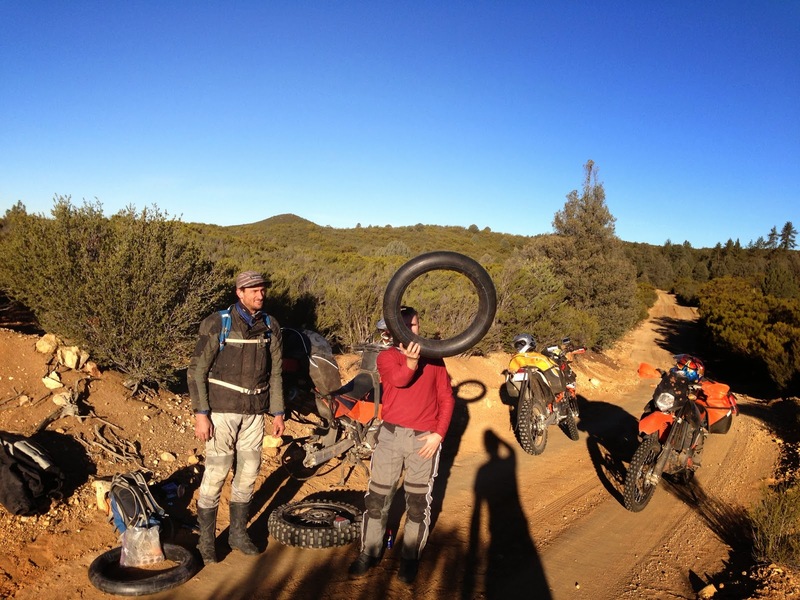 We find a bike shop and decide to try the largest tire we can find even though it is quite thin for the rim. The shop owner there was pretty sure it would work. And for once Jonny got to watch someone else change his tire! Tire is on the wheel and the wheel is back on the bike and was looking good. After lunch we had a decision to make, head for safety or trust the tire and head back into the dirt for one more night of riding and camping. 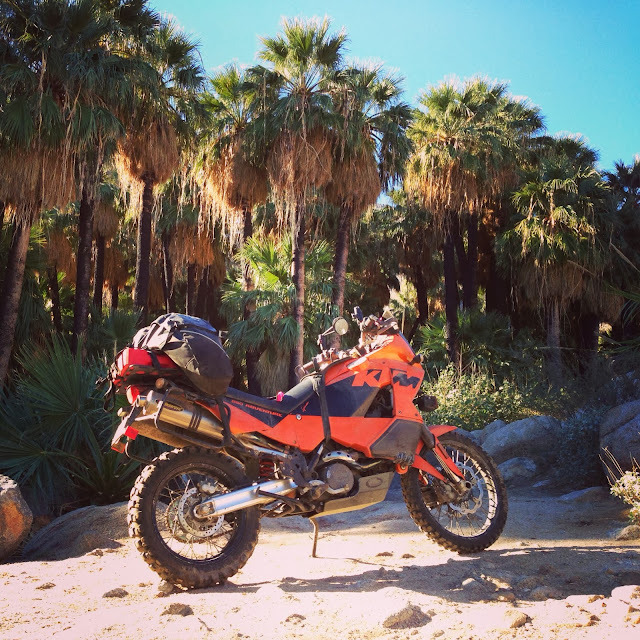 It took some time to get us all convinced that it was the right decision and we headed away from the border and back into the dirt. We had some great, fast and light dirt riding until near dark and then we started looking for a camping spot. We found a little wash and we decided to make camp and for once, before dark. We built a fire pit and pitched our tents. It was an awesome night, a great spot and felt really good to camp. We were all really happy to be there. We spread more of Bill's ashes here. He loved camping and would have been really happy there. Then we feasted on the remainder of our food and headed to bed early ... it got really cold really fast. 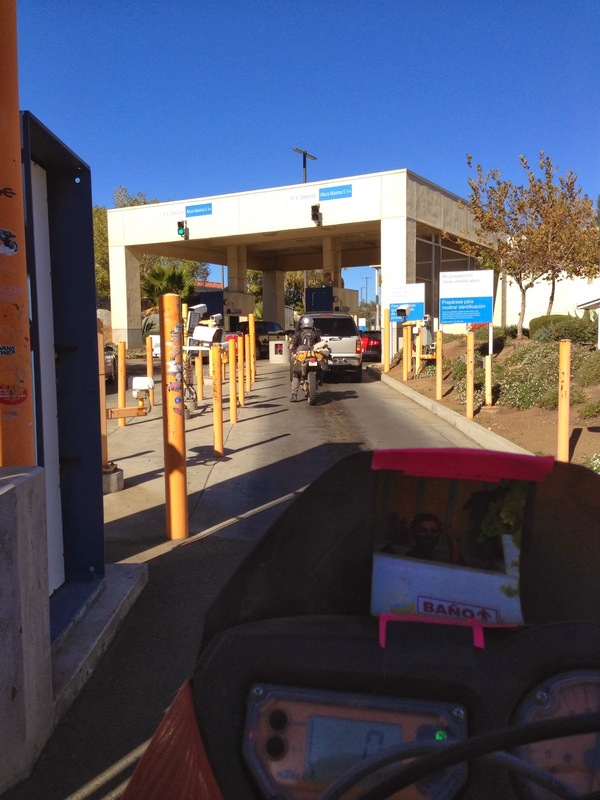 After a brisk night and little sleep we got up and out of our tents early and headed for the border. Just when we think we are done with flats Jonny gets another. We start to get a little concerned that we'd have a hell of time getting the bike out of the woods because we weren't sure that patching the tube would last very long and that's when Jimmy notices a nail! Of all the flats Jonny gets unlucky and picks up a nail on top of it all. Some guys have all the luck. We celebrate the last tire change of the trip and head out. It's still pretty early and we plan to reach the border around 11. 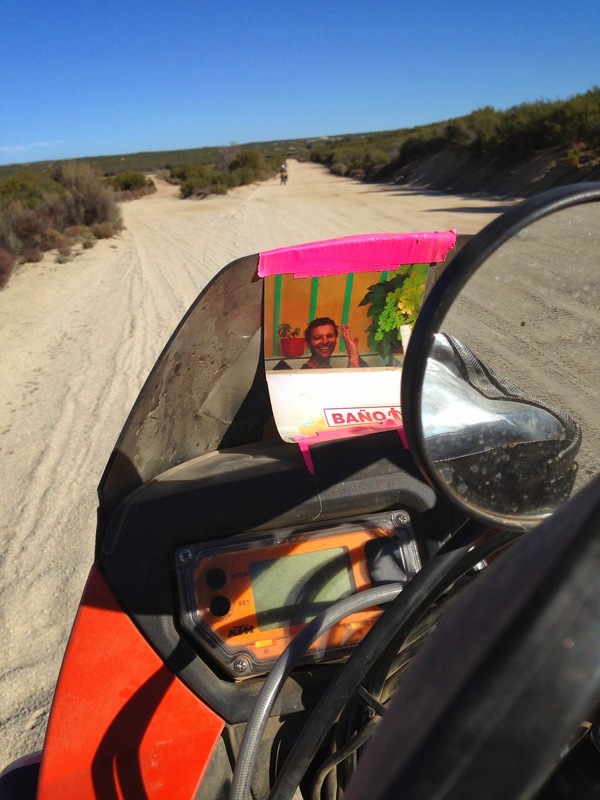 On the way we spread the last of Bill's ashes while riding and say our goodbyes to Bill and Baja. We reach the border before 11 and have built up an appetite for some dollar tacos. 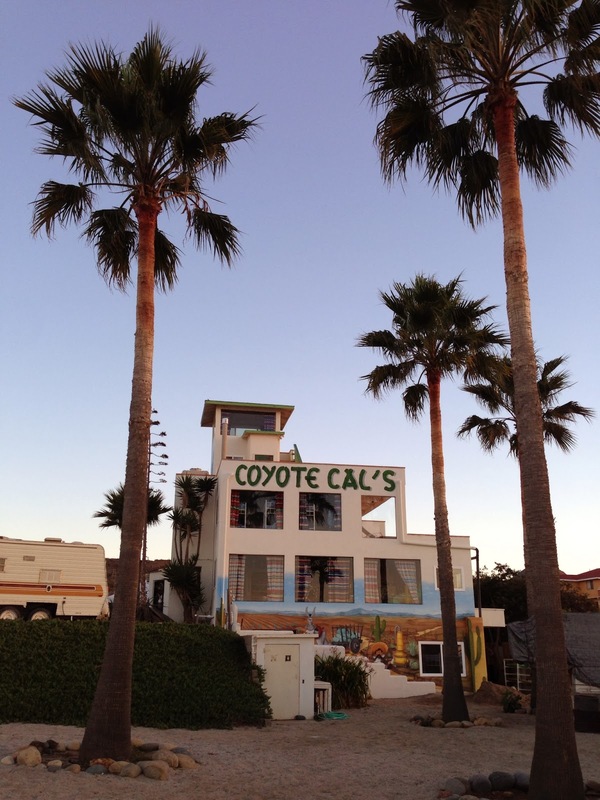 We enjoy our last meal in Baja and then head over the border. Overall it was an amazing adventure with great friends, thanks Jimmy and Jonny and cheers to our new Canadian friends! Bill, this one's for you!! !